[wp_ad_camp_2]Anyone who owns a Labrador Retriever knows the trials and tribulations of vigorous chewing. 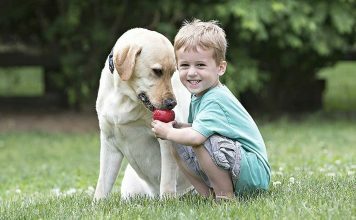 If you don’t nail it down, your Labrador Retriever will put it in his mouth. 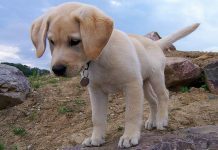 You might wonder why Labradors have this tendency, and the answer is simple. 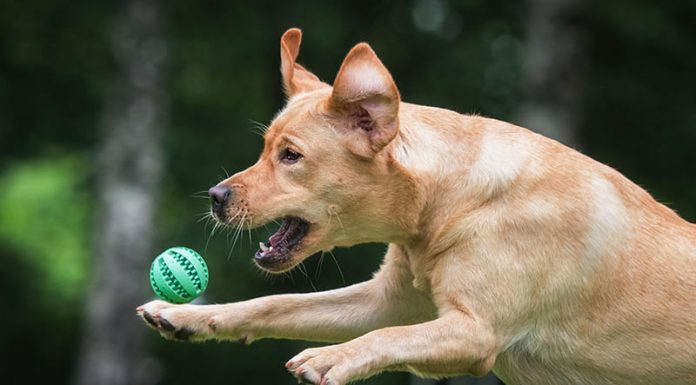 They were bred to be retrievers, and since they retrieve with their mouths, this explains their habit of chewing and carrying objects around between their teeth. 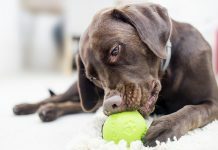 While finding chew toys can help to discourage destructive chewing, Labrador Retrievers will often destroy even the most seemingly indestructible toys. 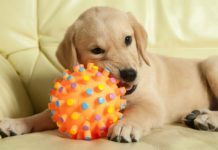 In this article, we’ll take a look at some of the possible chew toys that can withstand even the most enthusiastic chewers. 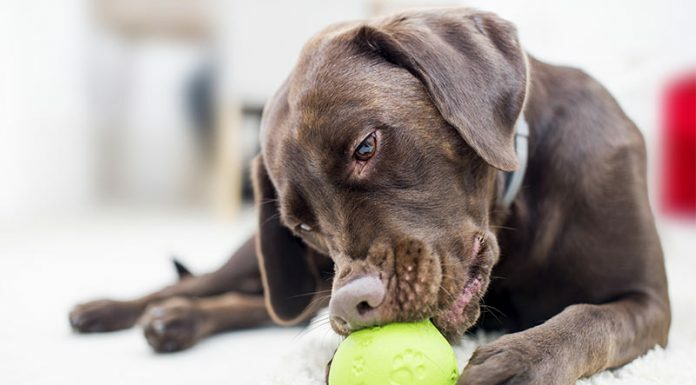 The Kong , a rubber, pyramid-shaped toy consisting of three balls pressed together, can provide your Labrador with endless hours of distraction because it works both as a chew toy and as a treat dispenser. Made of puncture-resistant rubber, the Kong comes in multiple varieties, including the Puppy Kong and the Red Kong (for heavy chewers). 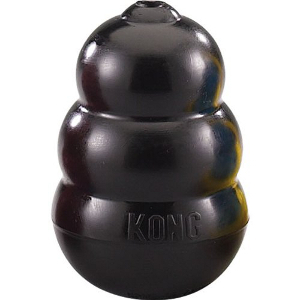 There is even the Black Kong for extremely heavy chewers. You can also find Dental Kongs , with ridges designed to clean debris from your Labrador’s teeth. You can stuff a Kong with a number of soft or hard treats, including peanut butter, beef or chicken-flavored pastes, or kibble. 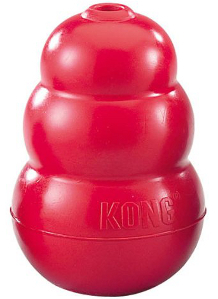 The official Kong brand treats work particularly well because their shape is designed to fit inside the Kong. 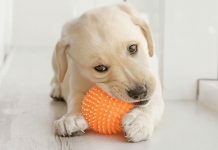 Soft treats like peanut butter and pastes can provide instant gratification but won’t keep your Labrador occupied for as long as using hard treats or frozen fillings. 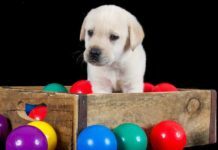 Being rather intelligent, Labradors enjoy a challenge, and the Kong both responds to their basic instinct to search for food and challenges them to use their brains. 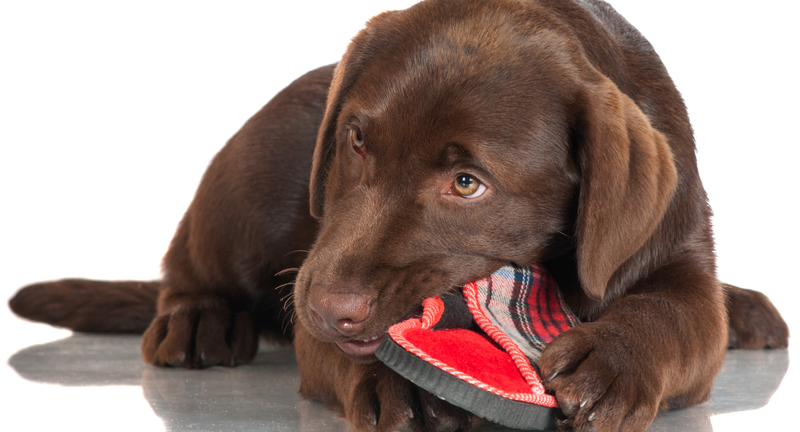 Made of durable, non-toxic rubber, Kongs provide a fun, safe, and versatile outlet for your Labrador’s chewing tendencies. While you can easily stuff them with treats, the variety of shapes and sizes and their bouncy quality also make them excellent fetch toys. My Lab enjoys playing fetch with himself, bouncing his Kong off of the tile and catching it. 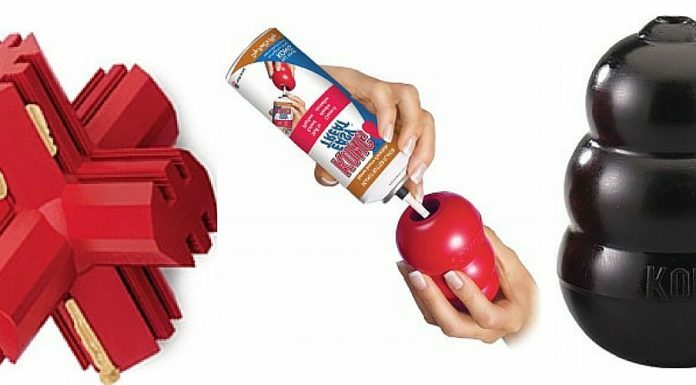 Whether you want to engage in interactive play or need something that will keep the dog occupied for hours at a time, the Kong can suit your needs. Another interactive chew toy, the GoughNut, like the Kong, is made of tough, indestructible rubber for long-lasting, safe chewing and play. 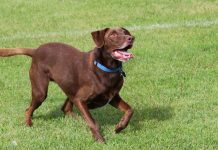 Since variety is important to keep a Labrador entertained, the GoughNut comes in several different shapes: a ring, a ball, and a stick, as well as different sizes. Most importantly, the GoughNut is designed for safety, color-coded with a green exterior layer and a red interior layer that will indicate whether or not it’s time for a new toy. We’ll talk more about how this works in the following section. Like the Kong, the GoughNut doubles as a chew toy and an interactive toy. Not only does it come in multiple sizes and shapes, it also floats, bounces, and rolls. 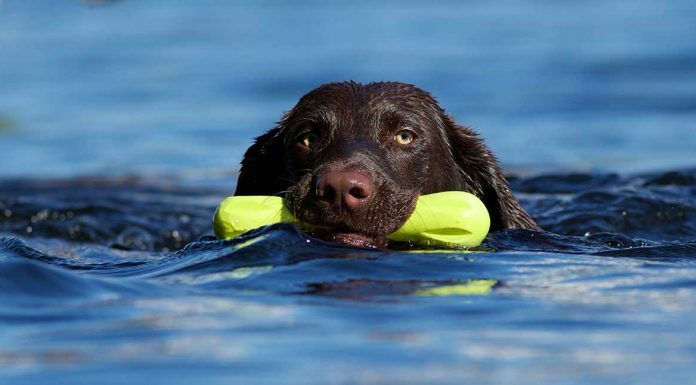 For your water-loving Labrador, the GoughNut provides a safe, fun way to play fetch in the pool or at the beach. As mentioned above, the makers of GoughNut have designed it with visual safety indicators using the universal colors for go (green) and stop (red). The outer layer of the GoughNut contains green rubber, meaning the toy is safe for your dog to play with. If your dog chews through the green rubber and the red becomes visible, the toy’s structural integrity has been compromised and it’s no longer safe. 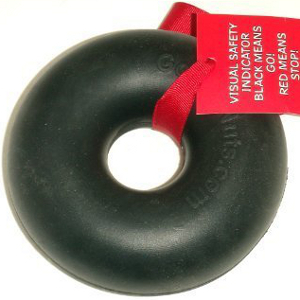 Since the manufacturers of the GoughNut designed it to guarantee safety, if your Lab chews through the green rubber to the red, you can return the toy for a replacement, or simply throw it away. We all know how energetic Labradors are, and the makers of ChuckIt! toys have embarked on a mission to make playing with your Lab as interactive and entertaining as possible. 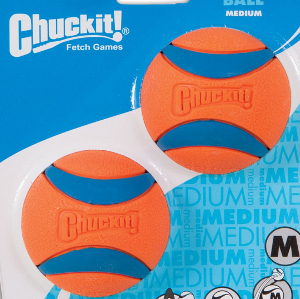 Chuckit offers a wide range of interactive fetch toys, including the traditional tennis ball style, the Kick Fetch Ball , and the Flying Squirrel . Made of ultra-tough, indestructible rubber, these toys are designed to withstand hours of fun. The Chuckit is easy to clean and designed for both indoor and outdoor use. Trees, rocks, water, dirt—Chuckit is durable against all of it. To satisfy the retrieving instinct in your Labrador, Chuckit also manufactures several types of launchers . These have the dual benefit of helping you to toss the ball even further and avoid slobbery hands. With Chuckit, you have an endless array of possibilities for play. The Kick Fetch Ball, for instance, roughly the size of a soccer ball, can be either kicked or thrown, floats in water, and never deflates. The Max Glow Ball ensures maximum play time, from sunrise to sunset, with a long-lasting light that charges quickly under any bright light. Send your Lab in hot pursuit with the Flying Squirrel, with the ability to float and glow in the dark paws, to make hunting it down even easier. 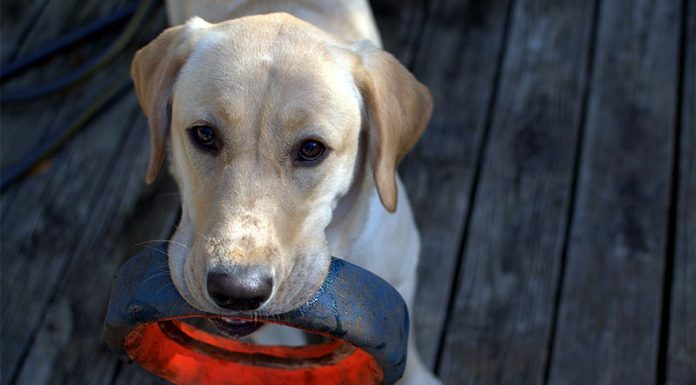 Whatever the shape or size, Chuckit toys provide your Lab with endless entertainment and exercise. The Galileo Bone by Nylabone is a chew toy specifically designed for aggressive chewers. It is constructed from extra tough nylon and is therefore should be even stronger than other Nylon bones. Like Kongs, Galileo Bones come in various sizes. Nylabone recommends that you choose the largest bone your Labrador can comfortably hold to ensure maximum enjoyment and durability. 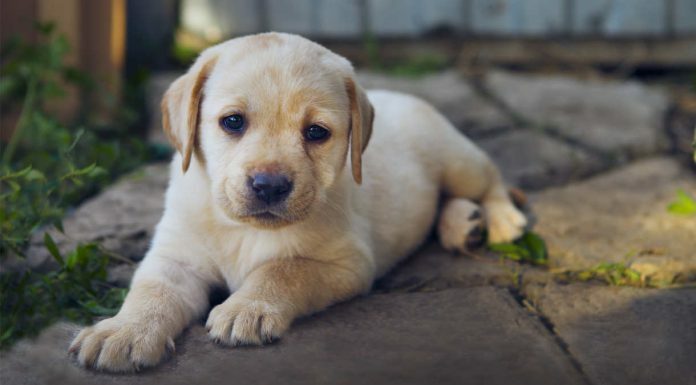 As mentioned earlier, Labradors have a natural tendency to chew, and constantly gnawing on a bone provides focused action that keeps them occupied and relieves stress. Because of their tough construction, Galileo Bones hold up well against powerful chewing and can last a long time (though the strength of your dog’s chewing will likely be the best determinant of lasting ware). The Galileo Bone will both entertain your Labrador and keep him healthy, massaging the gums, strengthening and cleaning the teeth, and exercising jaw muscles. The material also wears down gradually rather than splintering or breaking off, which prevents your Lab from ingesting pieces of the bone, so it is perfect for unsupervised play. 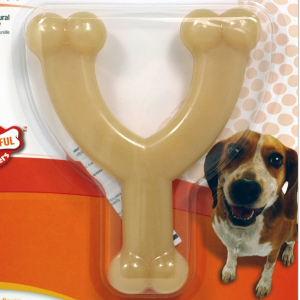 Also made by Nylabone, the Wishbone is a fun alternative to the Galileo bone. If your Labrador becomes bored easily, you probably want to keep several varieties of the Nylabone on hand. Made of tough, durable Nylon, the Wishbone is infused with natural beef or chicken juices and comes in a large, regular, and wolf size. The Wishbone, like the Galileo Bone, can keep your Labrador occupied for long periods of time because its wishbone shape makes it easy for the dog to grasp, and the bone is infused with natural beef or chicken flavors. My Black Lab took to this bone more than any other; I remember him once chomping determinately away on a Wishbone for almost an hour without losing focus. The Wishbone is also odor-free, safe to wash with soap and water, and wears down gradually rather than splintering. Chewing is a common challenge that Labrador owners face. Since Labradors are retrievers by nature, they have a natural instinct to carry things in their mouths. Other environmental stresses like separation anxiety and boredom can often exacerbate chewing. The trick to ensuring that your Labrador’s chewing doesn’t become destructive is finding suitable toys for him to play with that will occupy him and withstand his powerful jaws. 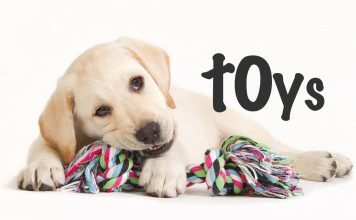 There are a variety of toys on the market including the Kong, the Chuckit, Nylabone products like the Galileo Bone and the Wish Bone, and the GoughNut, as mentioned above. 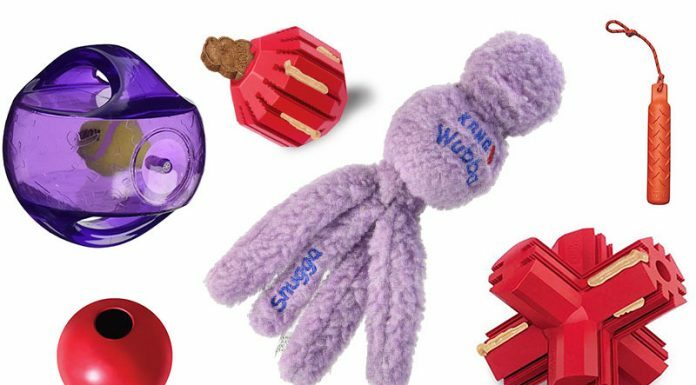 There are also a wealth of other tough chewable toys available that you could let your Labrador try out. 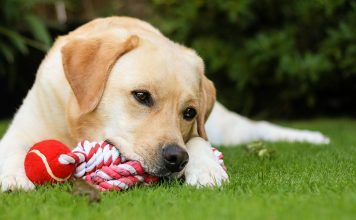 Just be sure to choose toys are safe both for unsupervised chewing and interactive play, as well as being made of puncture-resistant rubber or hard materials like durable Nylon that won’t splinter or break, allowing your Labrador a happy and healthy way to play. Francesca is a freelance writer who provides guest posts for The Labrador Site. 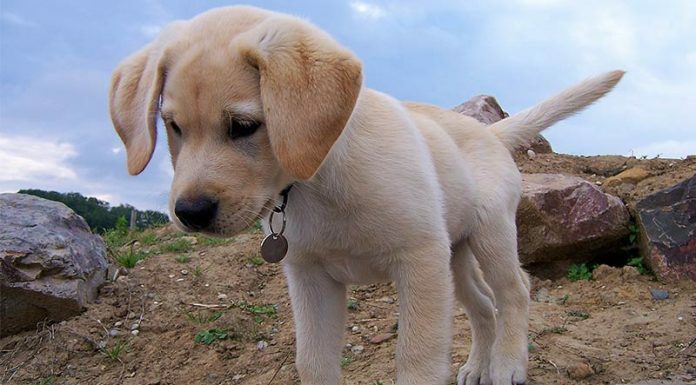 As well as being a Labrador owner, she has eleven years experience of working with Labrador guide dogs. Nylabone almost KILLED my chocolate lab!!!!!! At 8 months old he needed expensive $$$$ emergency surgery. The Nyla one pieces, sure rice of grain size, but they can build up in the folds of the stomach! Interesting how the cases that make it to court get settled just prior with silence clause. we bought an antler which keeps our 6 month lab entertained. she does get a little bored after a while but 10 mins of quiet is better then zero! On a totally other subject…what have you done when your lab has cut her foot pad? We have gone the sedation / stitches / head cone route and I am not sure this was a good idea. She is so sad and frustrated with the cone. As well, she has been ingenious in devising postures whereby she can chew on her duct tape covered bandage. Ideas? Suggestions? The one consolation I take from our boy wanting to put everything in his mouth, is that if we get on him about it straight away he is willing to give it back without a fuss. He loves to test the waters: he’ll grab it, if we don’t take it right away then it’s his to play with! And at the very least we get to say “give” a lot and he gives it up, so it’s kind of training at the same time. Has anyone found a way to clean the inside of a Kong that has had peanut butter in it????????? I soak it overnight in water and Dawn dishwashing liquid. In the morning I use a old toothbrush handle to scrape out any old peanut butter and the brush end to scrub inside after. Gentle cycle in the wash machine. it’s an idea. have not tried it myself.